A beautiful bridal boutique providing dresses, shoes and accessories from a vast range of designers. The owner, Miranda Holland, will ensure you receive a warm welcome and a fantastic service. I have personally seen some of the dresses and accessories they stock here and I can honestly say they are some of the best I’ve seen. View our exquisite range of bridal and wedding hair accessories, tiaras, wedding headbands, flower girl hair accessories, bouquet charms and jewellery, all handmade especially for you. 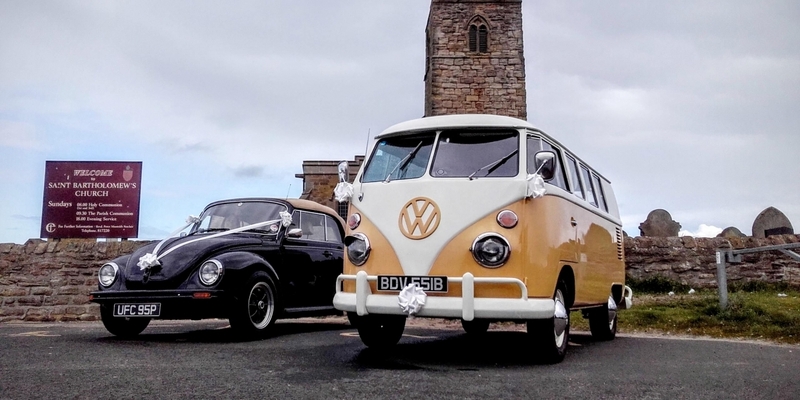 At Canny Campers we often get asked to recommend a classic coach company to go with the camper. I met a really nice guy today who has a family business and they have 7 classic coaches mainly from the 1950’s and also a 1936 Rover 14. Layland Tiger Club Vintage Bus Hire Vintage Coaches for Weddings, School Proms, Parties and Day Trips. Mustang Hire Sunderland An immaculate Mustang available to hire for Proms, Birthdays and Weddings with a driver. Experienced in all aspects of hair styling, professional make-up and nail care. La Belle Vous was launched in January 2011 by two sisters, Lucy Ward and Sally Ward who have combined there talents to offer you the complete package in the comfort of your chosen home or venue. We are experienced in all areas of hair and make-up, ranging from weddings, special occasions such as proms, models portfolio shoots and magazine publications. All of our artists are fully qualified and trained to guarantee you get the best services possible ending in a result you will be 100% happy with. Avant Garde Photography based in Northumberland and are available to photograph weddings throughout the UK and Europe, and have photographed 100’s of weddings over the last 15 years. We photograph the day capturing what is actually happening, and also photograph the essential group photos along with some portraits of the bride and groom. My wedding style is to combine a range of posed and casual shots from the day to create visual memories you can cherish forever. My aim is to produce a true record of your day capturing all emotions of the day from bride getting ready, service, speeches and finally beautiful photographs of bride and groom in a fun and natural way. The work of Focal Point has received National and International recognition in the fields of Wedding Photography and Portraiture. Extensive and diverse, their portfolio ranges from contemporary wedding photography to lifestyle portraiture; commercial advertising to uber-chic fashion location shoots. Gillian has over ten years experience as a wedding photographer and creates contemporary Storybook albums, to give you a lasting memory of your special day. I provide a range of styles from informal, candid, reportage to relaxed posed images with the aim of creating a truly stunning collection that reflects your wedding day. I am a completely self-taught photographer and although I dabble in many forms of photography, my deepest love is capturing images of people, especially on their wedding day. I mostly shoot weddings in my local area, but I do cater for the whole of the UK, travelling to and from weddings in my trusty campervan, Max. Wedding Photographers in the North East. Paul Santos Photography is recognised as one of the leading wedding photojournalists in Northumberland, Newcastle upon Tyne and the surrounding area. Photography excites me and i love that i get to put my style and ideas into every shot i take. I pride myself on being professional whilst always having a great rapport with my clients. Newcastle-based photographer, Sean Elliott, works from his studio in the biggest commercial art gallery in Britain, The Biscuit Factory. Sean regularly works with regional and international clients, as well as on commissions, working to a range of pictorial requirements. His work includes commercial, advertising and professional photography, exclusive North East wedding photos, portraits and modeling portfolios, landscapes, travel and fine art commissions. Simon Hogben is a contemporary lifestyle and wedding photographer based in the North East of England. Simon creates film inspired, romantic images at weddings and special events throughout the United Kingdom. A husband and wife contemporary wedding photography team covering the North East & Cumbria. Packages range from £675 – £1195 and all packages include fully edited high resolution photos on CD. Kelly and Caroline. The Twins. We photograph weddings and design bespoke stationery. We also confuse drunken guests for no extra charge. Caroline is a former BBC journalist who turned to photography full-time after studying at Central Saint Martin’s, London. Kelly ran her own graphic design company for several years with many big-names from the fashion and lifestyle industry on her client list. We are based in Newcastle-upon-Tyne and photograph weddings across Tyneside, Durham, Teesside, Cumbria and the wider north, but would love to hear from you no matter where your big day will take place. We promise not to both talk at once! Modern and stylish wedding, portrait and event photography. If I haven’t made you laugh out loud, shed a tear or grin from ear to ear I simply haven’t done my job properly. I am Victoria, the lead photographer at White Leaf Photography. I live in Northumberland but cover weddings all over, including the Lake District. Beautiful Handmade Wedding Invitations and Stationery, decorated with diamantés, priced to accommodate all budgets. Handmade by me offer a unique range of beautiful stationery, which can be as simple or as ornate as you wish. Each of the cards I design is individually hand crafted or painted. The result is a beautiful and individual design. Funk Conspiracy are a band who bring top class live music entertainment to your wedding or other special event. The North East’s most iconic castle is open all year round, an imposing coastal fortress with 14 public rooms and over 3000 artifacts. "Just wanted to say a big thank you to Canny Campers for letting us hire 'Little Joe' for the day, it was an amazing day and the camper van definitely got a lot of the spo..."
"Thank you so much for being part of our wedding yesterday we made completely the right choice. From the moment you arrived to minute we said goodbye you were fantastic. M..."